Order any 2 or more InvivoGen products on the same PO with Cedarlane and save 20% on each! InvivoGen's primary objective is to combine cutting-edge research with our technical expertise to create tools for the bioresearch community. Their unparalleled skill in microbial fermentation allows them to provide ultra-pure antibiotics made entirely without animal components, novel anti-mycoplasma treatments, and the largest collection of PRR agonists derived from a wide range of micro-organisms. Invivogen's collection of innovative Blue™ Reporter Cells is the result of the intensive study of the innate immune system combined with our vector design capabilities and cell culture experience. Moreover, they are expanding their collection of pNiFty reporter plasmids for the rapid and reliable monitoring of a variety of signaling pathways. Within "Antibodies", you will find novel pFUSE plasmids for antibody generation utilizing recombinant DNA technology. Harnessing this technology allows Invivogen to provide monoclonal isotype collections of therapeutically relevant antibodies. We also offer a unique set of vaccine adjuvants including our preclinical VacciGrade™ PRR Ligands. 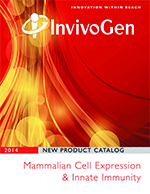 InvivoGen remains the only company devoted to marketing CpG-free plasmid DNA. They have added two new pCpGfree plasmid backbones to facilitate a better understanding of how CpGs affect gene expression, which is believed to be greatly important for the future of gene therapy. Note: This offer is not valid in conjunction with contract discounts or other special pricing. Void where prohibited.